LAKELAND — Seminoles in the Tampa area can see the light at the end of the tunnel for what will eventually be 150 new homes in Lakeland. A ceremonial groundbreaking of phase one took place Jan. 23 in front of more than 200 people who gathered at 9523 Moore Road. The site is near where infrastructure work will soon begin for a new residential community. 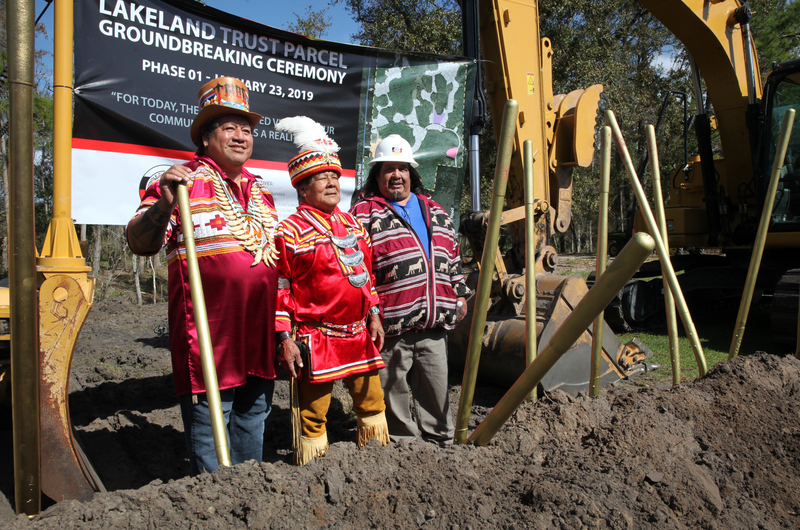 Tribal Council joined dignitaries from the city of Lakeland and Polk County to mark the occasion, along with Tribal members, Seminole Tribe of Florida employees and visitors. The message was similar from all who spoke: It’s taken a long time to come to fruition, but all the effort, which involved dozens of meetings and years of planning, has finally paid off. For years, Tribal officials and other stakeholders have been figuring out the best way to create a new community for those who were displaced by the Hard Rock Hotel & Casino Tampa. They’ve tried to do it as quickly as possible as well, to bring together scattered Tampa area residents who have yearned for a reservation of their own. The Hard Rock Tampa opened in 2004, but Tribal members had to start leaving well before the opening date. The Tribal Community Development office and its executive director Derek Koger spearheaded much of the work in the final stretch. At the groundbreaking ceremony, Koger thanked his staff and the many Tribal departments who were involved in the process, including special recognition to Senior Director of Operations Derrick Smith. “I can’t wait to walk into the first home. It’s been many years overdue for you to have your own community,” Koger said. Koger then introduced a short video that showed many aerial views of what the landscape of the Lakeland property looks like – a country feel with abundant water features, trees and other vegetation. 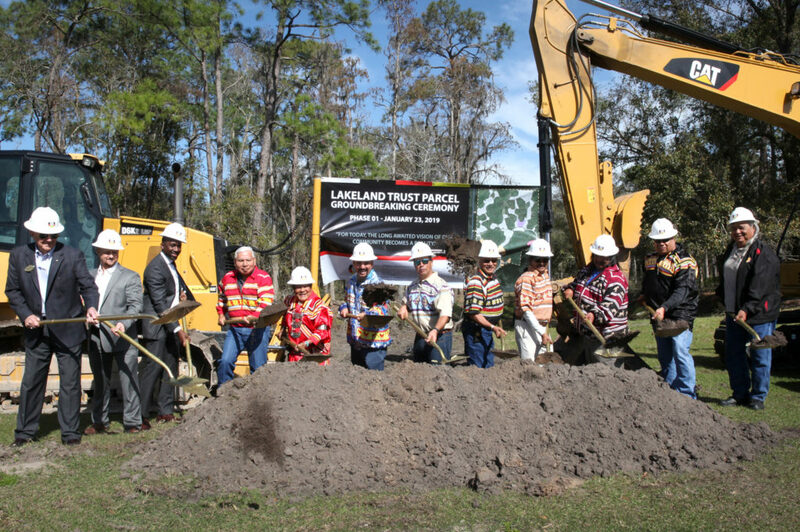 Brighton Councilman Andrew J. Bowers Jr., medicine man Bobby Henry, Senior Director of Operations Derrick Smith, Chairman Marcellus W. Osceola Jr., President Mitchell Cypress, Big Cypress Councilman Mondo Tiger, Tampa Reservation administrator Richard Henry, Brighton Board Rep. Larry Howard, Big Cypress Board Rep. Joe Frank and other dignitaries toss dirt signifying the official groundbreaking of the Lakeland property Jan. 23. The site includes 752 acres in all, purchased in 2007. It is about 37 miles northeast of the Hard Rock Tampa. The land was put into trust in 2016. Chairman Osceola said the Tampa community now numbers about 250. About 100 were moved to make way for the casino. “This is a tremendous achievement. We do this for the Tampa community after all the sacrifices they made so the Tribe could prosper,” Chairman Osceola said. Smith said after the infrastructure is completed, building will start on 47 homes with 1-acre lots and different square footage options. The first phase is expected to take about a year to complete. The originally displaced Tribal members will be first in line to apply for the new homes, Smith said. He said staff is also working on the design for a community center, which he hopes will be completed at about the same time the first homes are done. “It will be a flexible space to meet the needs of the residents,” Smith said. Other government structures will come later, and the Seminole Police Department and Fire Rescue will forge arrangements with Polk County officials. Herbert Jim, the Tampa culture language director, and Tampa Reservation administrator Richard Henry were on the forefront of bringing Tribal members to the land in Lakeland and showing them its potential. The two say they always thought it was important for those who have been scattered around Tampa to be able to gather in one location. Jim and Henry started holding community events on the site at Moore Road. They developed a cooking area, fire pit, and held cultural gatherings like Indian Day at the site – including times of song and dance. They wanted to make it a welcoming place, where Native language was spoken and the culture was preserved. President Mitchell Cypress said the location of the land, which is away from big cities, is important. “We need to get our youngsters into a wooded area where it’s clean, fresh air,” President Cypress said. Brighton Representative Andrew J. Bowers Jr. said he represents the Lakeland community as well as his own. “When we bought the property, we didn’t know that there were several owners and that set us back for about six years or so,” Councilman Bowers said. “We finally got the past owners off the ownership and asked the big folks in Washington that oversee Indian Affairs to take it into trust, and they did that about two years ago with the understanding that they’re holding it for the Seminole People for you to use how you want it,” he said.